Every learner is important. With equitable access to a great education, we believe that every child will learn and be successful. We can reach this goal with careful and intentional structuring of our educational systems, and when necessary, changing the way we deliver instruction and supports. Wisconsin schools and districts are tasked with equipping every student with the knowledge, skills, and habits necessary for success beyond high school. To do this, we must offer developmental, academic, behavioral, and social-emotional supports. Additionally, every learner’s needs are different, so supports must be provided at varying levels (or tiers) of intensity. How can schools and districts set up their educational systems to meet these needs? The Wisconsin Department of Public Instruction and the Wisconsin RtI Center’s vision is that schools and districts implement equitable, multi-level systems of supports. 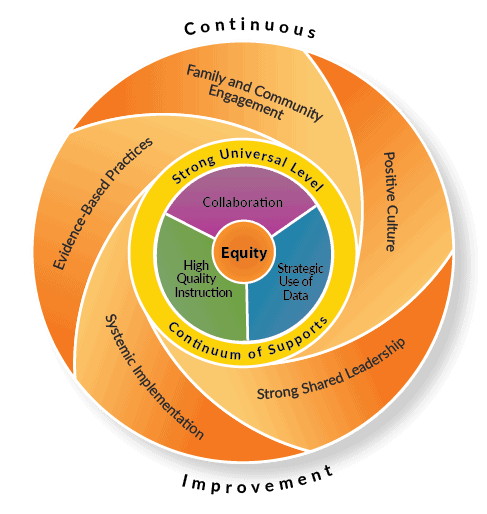 What does an “equitable, multi-level system of supports” look like? An equitable, multi-level system of supports is a framework made up of 11 key system features. Implementing equitable, multi-level systems of supports can help schools and districts across the state realize their mission to ready every learner for college and career success.